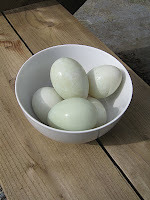 Elusive Onions: What the Duck? 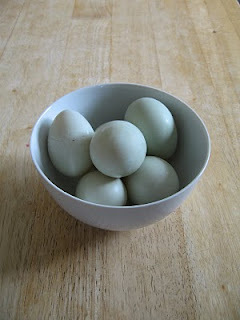 There are a half dozen duck eggs in my fridge. I'm not sure why I bought them. Probably because I've never had the opportunity before. Maybe because I have some vague memory of my grandmother buying duck eggs. It just seemed like the right thing at the time. Now I'm not sure what to do with them. Today I took them out of the fridge and took pictures of them. Here I shall offer some unsolicited advice: jump right in and cook those eggs! Don't horde them! I say this as a person with a tendency to horde things and then not use them. I'm trying to reform myself. As Gretchen Rubin (of The Happiness Project) would say, "Spend out." 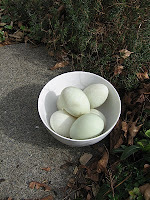 Meaning that doing something with those duck eggs will bring you happiness...and more photo opportunities! Rosiecat, you know me too well for someone who hasn't met me! My hording instincts prompted yesterday's post. I had discovered two once-beautiful portabellini mushrooms in my fridge. I had saved them until they weren't fit to use. I didn't want that to happen with the eggs. My plan was to write about them, take pictures of them and basically get them out of the fridge where I could bask in their eggy magic before cracking them open. I know this sounds completely nuts. I blame it on my Ukrainian heritage. Pysanky (decorated Easter Eggs)are kept for years, though I'm too far removed Ukrainian ancestors to know how to make them myself. 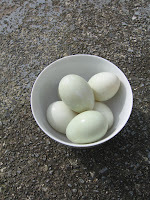 My plan seems to have worked; last night's dinner was duck egg frittata. No photos, as we were too hungry to pause for pictures! There are 3 eggs left, so maybe I'll break out the camera for those. Thanks for the sensible advice Rosiecat. I'm going to have to look for that book!